Hey, guys. Sean here from The Roman Guy.Thanks to all your user support. We're doing yet another episode of our Neighborhood Series. Today, we're at the Vatican City. They say that six million people per year go to the Vatican City, inside the Vatican museums alone. Where the crowds go, tourist traps tend to follow. It's really important that you know where to go, what to see, how to see it, where to eat, and obviously, where to drink. Take a look at this map of Rome in order to get a better idea of where the Vatican City is in respect to the other attractions. 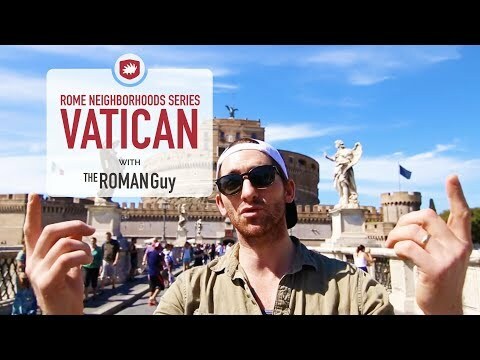 We've zoomed in here to show you what we refer to as the Vatican neighborhood which is actually part of three separate Roman neighborhoods: Prati, Borgo or Borgo Sant'Angelo which and Vaticano or the Vatican City. Now, the main attraction is obviously the Vatican City which is a few things. Now, it's its own government, it's its own state, as well as its own religion. The Vatican City has two points of interest. The Saint Peter's Basilica which I was standing outside of earlier. It's free to get inside and it's amazing. 7:00 AM to 7:00 PM in the summer and 7:00 AM to 6:00 PM in the wintertime. The second part is the Vatican Museums. Now, don't show up to Vatican Museums without anything just hoping to get inside. I mean, you will but you'll wait in line for an hour or two hours maybe three during the high season. You want to reserve a ticket beforehand which is great, you should skip most of the lines, you still might deal with some issues getting in but for the most part, you'll be set. If you want the Vatican Museums to come alive in front of your eyes, you have to do a guided tour. That's something we offer on our website as well and you can get more information once again in that blog below. When in Italy, do as the Italians do and get your breakfast on the road. They get a cafe and cornetto, €2 max. You sit down, it's going to cost you more. This little place is right near the Metro Ottaviano on the way to the Vatican Museums, it's called Bar Giulio Cesare. This is also a great point to grab a bottle of water. Once you finish it, hold on to it. This street, called Borgo Pio, is just a few blocks away from the Saint Peter's Basilica and the Vatican Museums. It's a little touristy but it has that Roman feel which I love. Restaurants outside with outdoor seating, pedestrian street. It's beautiful so why not. There's a restaurant called Il Mozzicone, it's a good choice for pasta. Remember that bottle of water I told you to get before the Vatican? I told you it'd come in handy. These fountains are everywhere. This one's on Borgo Pio right at the end. In Piazza Risorgimento, there's a sandwich shop called Duecento Gradi. They make custom sandwiches otherwise known as panino. Little fun fact, in Italian, you don't call that panini. Panini is plural so if you're going to be getting two sandwiches, you're going to go get panini. If you're going to get one, you say panino. Just behind me, look at this massive wall. It's called Il Passetto Di Borgo. Now, if you're going to head to Castel Sant'Angelo, the easiest way to do it is go to the Saint Peter's Basilica, find this wall, and follow it straight to the castle. Now, the reason it's here is because underneath it is this underground passage called Lesotho Passaggio. The pope used to use it to escape from the Vatican City in case of attack to go to the castle which is a massive fortified area. We're here at Ponte Sant'Angelo. Right in front of the Castel Sant'Angelo. Originally, it was built in the second century AD to be the mausoleum of the Emperor Hadrian. Now, the Ponte Sant'Angelo literally means the bridge of the saint angel and it sits in front of the Castel Sant'Angelo which is the castle of saint angel. You can see the statue of the archangel Michael on top which apparently is there because Michael came down in the middle ages and sheathed his sword on top of the Castel Sant'Angelo. That was saying that hard times in Rome were coming to an end and prosperity was to come. Today, it's a cool place to walk around and has an excellent viewpoint. Check out the gelateria, Old Bridge. Coin is a great one-stop shop for a lot of different Italian designers and brands.